The most active volcano in the Philippines looks utterly terrifying after a day of eruptive activity that prompted the Philippine Institute of Volcanology and Seismology (PHIVOLCS) to ratchet up the warning level to 4. According to authorities, a violent eruption could be imminent. Mayon Volcano, which has been rumbling since Jan. 13th and started dribbling lava down its flanks early last week, has gotten a lot angrier over the past 48 hours. Per PHIVOLCS, a “dense, five-kilometer tall eruption column was generated by a short-lived phreatomagmatic eruption” at 12:43 pm local time yesterday. In human-speak, that’s an eruption involving both magma and water, generally resulting in the release of steam alongside pyroclastic material (hot, dry masses of ash and rock). 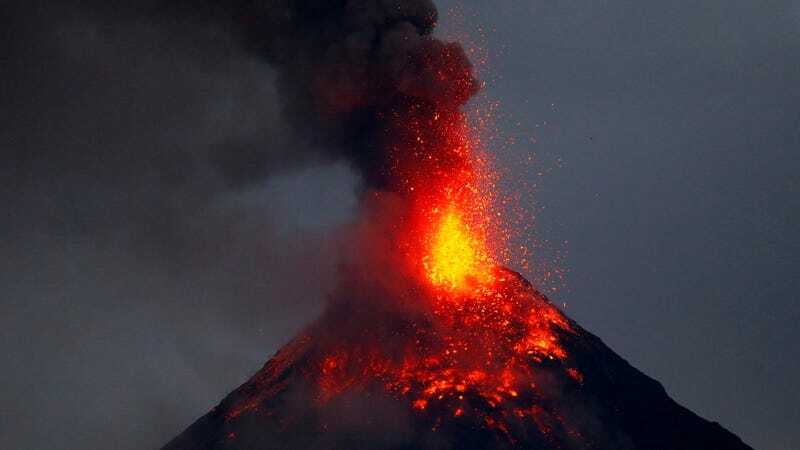 That eruption was followed, several hours later, by five episodes of “intense but sporadic lava fountaining” that reached up to 700 meters (2,300 feet) high and ended around 5:30 am this morning. Earthquakes, tremors, and rockfalls are being recorded all over the volcano. This uptick in activity is what prompted PHIVOLCS to raise its alert level on the volcano from a 3 (an explosive eruption is possible within weeks) to a 4 (any day now, kids). A larger eruption could involve deadly pyroclastic flows that even Chris Pratt can’t outrun, tall eruption columns, and major ash fall throughout the region. Heavy rainfall could also drive mudflows and trigger landslides, according to the Associated Press. Filipino authorities are taking no chances. The higher alert level extends the “danger zone” to a radius of 8 kilometers (5 miles) surrounding the volcano. As of Tuesday, the AP reports that more than 56,000 residents had been evacuated to shelters. Aviation authorities are being advised to avoid flying planes anywhere near the volcano’s summit. Per the AP, provincial authorities have even recommended cutting off electricity and water within the danger zone to deter folks from returning home. That’s the level of danger we’re talking about here. And if anyone reading this from the Philippines needs further reminder of the risk, just take a look back at history. Mount Mayon has erupted roughly 50 times since record keeping began in the 1600s, and many of its outbursts have claimed lives. Its deadliest eruption, in 1814, reportedly flung burning stones, sand and ash into the stratosphere, engulfing the surrounding region in darkness and killing over 2,200 people. Remember, folks, fighting Mother Nature is a fool’s errand.